Though he brought his team to level, Gomis was shown a red card and will miss the next match. Game week 15 in Super League witnessed a magnificent comeback Saturday after Galatasaray reversed a 2-0 deficit to beat Teleset Mobilya Akhisarspor 4-2 in Istanbul Türk Telekom Stadium. The Lions went behind in the 17th minute when Brazilian defender Maicon trying to clear a dangerous low-cross by Akhisarspor player Miguel Lopes put the ball into his own net. The Istanbul club conceded another shocking goal in the 45th minute, only two minutes after Lopes was shown a red card for taking down Yasin Öztekin just outside the penalty box. Akhisar's Olcan Adın saw that Galatasaray Fernando Muslera was out of his box and hunted the experienced goalie with a long chip. However, the second half proved to be a fairytale for Galatasaray. Midfielder Fernando Reges scored from a long way out in the 49th minute, to give the Lions their first goal. Just two minutes later, his effort was followed by Bafetimbi Gomis. His powerful strike deflected off Akhisarspor defenders to find the bottom right side of the net. Though he brought his team to level terms, Gomis was shown a red card in the 68th minute. 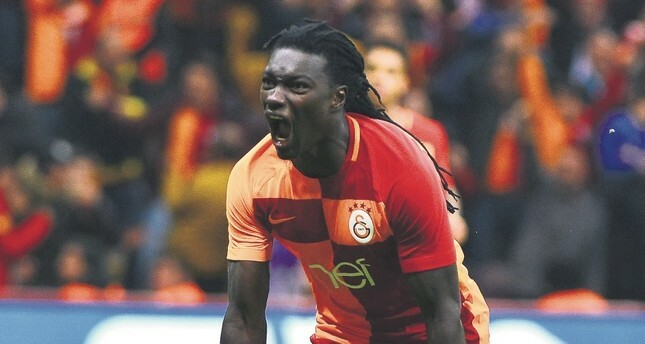 Galatasaray took the lead with a third goal in the 70th minute. This time it was Younes Belhanda who found the net inside the penalty box after defender Jason Denayer barely managed to keep the ball inside and made a cross. Sofiane Feghouli let it pass between his legs to set up Belhanda with an easy strike. In the dying minutes of the match, Feghouli got on the scoresheet through a counterattack. With the win, Galatasaray took their points tally to 32 while Akhisarspor were left with 19. The other Istanbul giant, Fenerbahçe also continued its winning run, beating a very dangerous Bursaspor 1-0 on the road. The Canaries found the goal in the second half after Spanish striker Roberto Soldado was taken down inside the penalty box. Brazilian attacking midfielder Giuliano calmly converted the penalty in the 65th minute to give his team a 1-0 lead. Bursaspor could not produce the equalizer in the remaining minutes. Fenerbahçe increased their points total to 29 after the victory while Bursaspor remained with 24. Meanwhile, Turkish footballers and fans voiced support for Palestine after U.S. President Donald Trump's controversial decision to recognize Jerusalem as Israel's capital. Footballers from Galatasaray and Teleset Mobilya Akhisarspor were holding a banner that read "Jerusalem is our red line" as they stepped on the field at Türk Telekom Stadium in Istanbul. Galatasaray fans also unfurled banners that carried the words like, "If Jerusalem is not free, the world remains captive" and "Jerusalem is Qiblah, Jerusalem is Miraj," referring to the Muslim's first direction of prayers. Earlier, the footballers of Adanaspor and Elazığspor also held a banner reading the same message ahead of their First League game. In southeastern Turkey's Gaziantep, Gazişehir Gaziantep and MKE Ankaragücü, also from the First league, carried the pro-Palestine banner.The move came a day after the Turkish Football Federation (TFF) requested all football clubs in the Super League, First, Second and the Third League, to carry Jerusalem banners onto the pitch ahead of the kickoff.